Frankie Pickle has a big imagination but he's not so good at math. While taking a math quiz, Frankie begins to draw number monsters. Maybe if he skipped ahead the next problem would be easier to solve. It wasn't. This one was even scarier. In fact if Frankie turned his head sideways, the number three kind of looked like fangs. He drew a pair of wings on it. Now it was a vampire bat He added horns and claws and spiked tails to the other numbers. Frankie fails the quiz. He has the weekend to study for a make up quiz. Frankie's family is keeping him busy and secretly teaching him math can be fun. 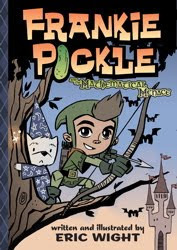 Frankie Pickle is a great character. This is the third book in the series. It's as good as the first one. One of the best things is it's visual appeal. Wright's illustrations are wonderful. Simply a well done early chapter book. This would be a great recommendation fans of The Lunch Lady series by Krosoczka and are looking for something longer.